We are self-proclaimed caffeine junkies. We wake up every day and head straight to the coffee pot at home. This doesn't change much while camping, except we don't have power. 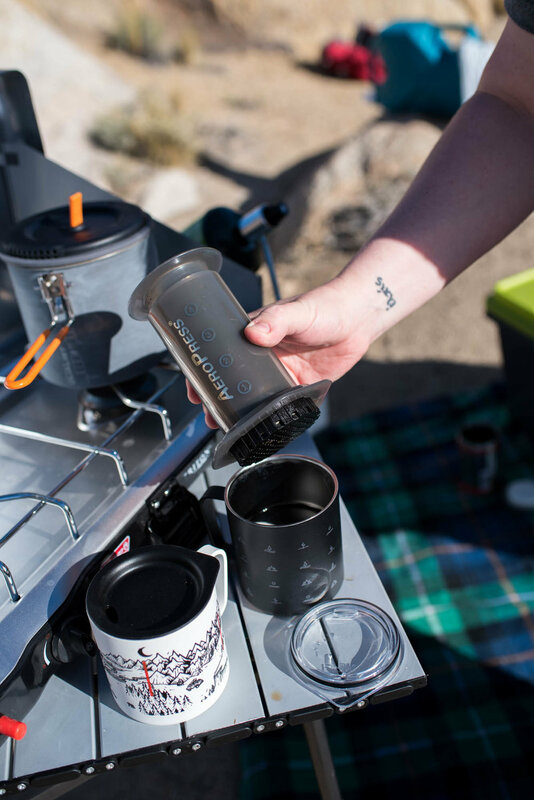 So how to we get our caffeine fix while we're at a camp site or in the backcountry? We've learned what we enjoy the most (and the least) by trying out several different styles!. When we started camping, we thought this was the only way to have coffee. Find some way to make hot water (we tried over a fire, and failed horribly) and just stir in some powder and it's ready to drink! Jars of instant coffee available at the grocery store are just gross, though! We try not to be too coffee snobbish, but that stuff is just not enjoyable. Instant coffee in any form is the easiest to have in the backcountry. No wet filter or grounds to deal with, just a small bit of trash to pack out. From Starbucks Via to Trader Joe's Packets and Jars, we've maxed out our limit on instant coffee. We definitely do not prefer this method, but in a pinch - we keep the Trader Joe's Instant Packs in our emergency camping stash. Despite including creamer and sugar, these maintain a fairly drinkable cup of coffee in the backcountry. We stumbled across Voila Coffee on Instagram a couple months back. We jumped in a bought a couple of "Discovery Packs", which we thought would come in handy for an upcoming adventure in a camper van. We were right. These packets were so convenient - good for a hot or cold cup of coffee. And the flavors were excellent. This is not the "instant coffee" we know and struggle to drink - this is really good coffee. Specialty roasts made into these little single serving packets, just add water, and enjoy a delicious cup of coffee. Voila sets a whole new standard for "instant" coffee. This option is also great for the backcountry, and something that comes in handy at times. This style of coffee comes pre-packaged in a filter, somewhat like a tea bag. They usually have cardboard supports that let them sit on top of a mug, and then just pour water over the filter. It creates an instant cup of coffee. Our experience with these have varied from horrible to okay. We've had very weak cups of coffee, to very bizarrely flavored cups. We expected this style to be a top choice, but after a few tries, we moved on. If this is a style you want to try, we recommend Kuju Coffee (great taste and strength of coffee) or Geo (a good basic cup of coffee). Those are two of the better ones we've had! These are nice for backcountry, since it can be easily packed out in a trash bag. Leave it out to dry a little while packing up, and your trash bag won't be as soggy! For this trial, we used the UST Collapsible Flexware pour-over stand. It is a lightweight silicone that collapses, then opens up to sit on top of a mug. This method requires a filter. Add the filter and some coffee, then just pour over hot water. Our coffee maker had a tendency to leak around the mug a little, and we had to deal with the wet (floppy) filter and soggy grounds - just a tad too messy. The flavor was good, since we could just bring coffee grounds from home and drink whatever we like. It still had a tendency to be a little on the weaker side, but drinkable. Bottom line - too much mess. 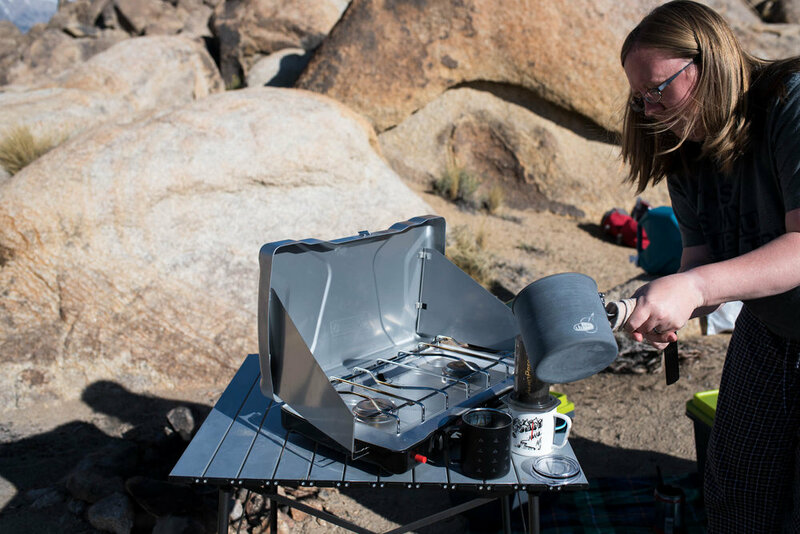 We have been Jet Boil users since our very early days of camping, so it seemed natural to make it pull double duty and make our dinner and our coffee in one pot! This was just not meant to be. While it makes one of the stronger and better tasting coffee of all the methods we have tried, it just makes a mess. We always had grounds in our cups (the filter does not form a tight seal with the pot). We use our Jet Boil to make other meals, even if it is just boiling water to re-hydrate a meal in a bag. Making coffee in the pot means having to scoop out the grounds and rinse out the pot, and still, everything else we cooked had a little coffee flavor to it. We tried to clean the pot better, despite usually having limited water supply, but in the end, we just didn't like this system. It was always a mess trying to clean up, and we follow leave no trace principles, so having soap and coffee grounds to dispose of, when there is no trash pick up or sink, is just a pain. The French Press does have the benefit of making a larger amount of coffee, though, so if you need to make a few cups at once, this may be a good option. If you camp in places with water and dishwashing areas, this would be a better option, but we just don't tend to have running water where we camp. This has become a routine for us on longer camping trips. We grab a few cans of ready to drink coffee - typically High Brew or Starbucks - and stash them in the cooler. High Brew is less sweetened, so we prefer it over the sweeter Starbucks option. Starbucks does make a glass bottle of cold brew coffee that is very good tasting, too! We branched out and tried the nitrogen brewed cold brew from Trader Joe's, but we were not big fans. The coffee is dark and rich, but a bit too bitter. It seems like it'd be good poured over ice, but that's not happening at our campsites. The nitrogen brewed aspect makes for a fun time of "pouring hard" to activate it and get it foaming. Maybe a tad too fancy for camping?! We started hearing and seeing the Aeropress around a couple of years prior to trying it. We always heard good things, but couldn't quite comprehend how this plastic tube would be able to make a delicious cup of coffee. The word on the street was right, though. This lightweight plastic tube goes on every trip we take now. The method is simple - put a paper filter in the bottom, screw on the plastic filter, add coffee grounds. Slowly pour a small amount of hot water onto the coffee, then add more to your desired amount. Stir for a minute, let it sit for another, then press the plunger down to push out the coffee. The result is one of the best cups of coffee, even at home. There are other methods for brewing, like the "inverted method", that add to the fun of this system. Clean up is easy - the pressure applied while making the coffee creates a small "puck" of coffee grounds. Take off the filter, press the plunger, and the puck pops out. There is typically nothing left to clean, unless the stir stick or plunger needs a rinse (it rarely does). This has become our favorite way of making coffee, unless we need a quick fix or can't get hot water. The coffee is rich and smooth, and can be made as a shot of espresso or lighter, depending on water added. While it really just makes one cup at a time, it's easy to split that cup and make a lighter Americano, if needed. We tend to use Illy coffee for our Aeropress, but any variety of coffee can be used. We love coffee (dare we say maybe a little too much). Kim loves the morning cup of coffee on a camping trip, sitting on a big rock and enjoying the scenery. Andrea is a bit more into the actual coffee, always trying to make the perfect cup of strong coffee. It's a drink that we don't go without, even when we are sleeping outside. Tell us - have you tried other ways? Do you have a tried-and-true style that you love?